ER. We’re here primarily to talk about your new book Against Ambience, can you briefly outline some of its main themes/topics. SKC. Against Ambience is an example of an endangered species – a book of good, old-fashioned criticism. It starts with an observation: that this past summer (2013) in New York, there were a lot of exhibitions devoted to sound and light: Soundings at MoMA, James Turrell at the Guggenheim, Robert Irwin at the Whitney, Janet Cardiff at the Met, The String and the Mirror at Lisa Cooley. One such show, at Tanya Bonakdar Gallery in Chelsea, was called ambient (lowercase a). Against Ambience considers all these shows in terms of their relationship to what we might call the “post-conceptual condition.” What is the relationship of the works in these exhibitions to the questions of conceptualism? Do these exhibitions represent a turn away from the 45-year arc of conceptualism in the gallery arts? Is ambience a branch of conceptualism; an example of what Lucy Lippard famously called the “dematerialization” of the work of art? Is ambience non-retinal and/or non-cochlear? Or is ambience a rejection of conceptualism, a move toward unmediated experience without concepts? ER. I presume the ‘against’ in the title implies a criticism towards ambience? SKC. I see this ambient moment as a dispiriting development. It strikes me as throwing out the baby and keeping the bathwater. Dematerialization is not a materialist issue. It’s not about the presence or absence of material. The important move of dematerialization, of conceptualism, is one of emphasis. The best work merely downplays the material aspects of the work, emphasizing ideas and the relationship of the work to the social, institutional, political, and economic forces that license it. (By the same token, non-retinal art is not about nothing to see and non-cochlear art is not about nothing to hear.) Ambience, however, dematerializes away from ideas and relationships and toward an a-signifying, and a-signifiable, experience that pretends to be inoculated from real-world engagements. The ambient portrays itself as a-social, un-institutional, a-political, unbeholden to economics. If ambience is about bliss, it’s surely the bliss of ignorance. ER. How are you defining ambience? SKC. Well, I’m careful not to define it. Ambience, in its typical usage, indicates precisely an attempt to evade strict boundaries and definitions. If I want to address ambience rigorously, I feel I have to meet ambience on its own terms and interrogate those terms from squarely within the premises of ambience. Still, ambience almost always implies an undifferentiated experience, something that can’t be broken down into constituent parts. Nor can it be adequately represented, because sign systems atomize experience into the elementary particles of their own codes. Such atomization is anathema to the ambient. The ambient is also something like an atmosphere or a mood. It saturates everything in it. Conceived this way, I don’t see the ambient as an equalizing or democratizing impulse. However, in Against Ambience, I discuss philosopher Timothy Morton’s use of the term, ambient, which is quite different from what I’ve just described. For Morton, the ambient describes the intrinsic presence of fissures between being and appearance. All things are subject to this essential gap between what they are and how they appear. All such appearing is a kind of representation, a transposition into codes that are not those of the thing itself. I try to keep the latent (or not so latent) Kantianism of this at arm’s length, and take a kind of Derridean position, which goes something like this: The gap between being and appearing is not a gap between the thing itself and any representation of it. The gap emerges from two contradictory realities: first, the pragmatic reality that forces us to proceed as if things are stable and self-consistent, and second, the reality that things establish their meanings and identities by means of a perennial reliance upon their contexts. I’m drawn to Morton’s account of ambience because I think it carries a pragmatic ethics. If we can begin to integrate the contextual reality of things into our practical encounters with them, we may be able to tease out a set of more ethical responses to our world. If this is what ambience means, then I can see a way to read it as a positive horizontalness. ER. Is the book in anyway a continuation of your last work (In the Blink of an Ear): how do the two things connect? SKC. I believe art is part of the world. A lot of work with sound (including a lot of music) tries to behave as if it’s not. Think of the adjectives that attach themselves to sound and music: ephemeral, immersive, transcendent, ineffable. The suggestion is that sound and music operate in a realm beyond the influence of capital and culture and race and gender. And while I can certainly understand the appeal of such a realm, I don’t believe it exists. Sound, like everything else, is burdened by being a thing-in-the-world. 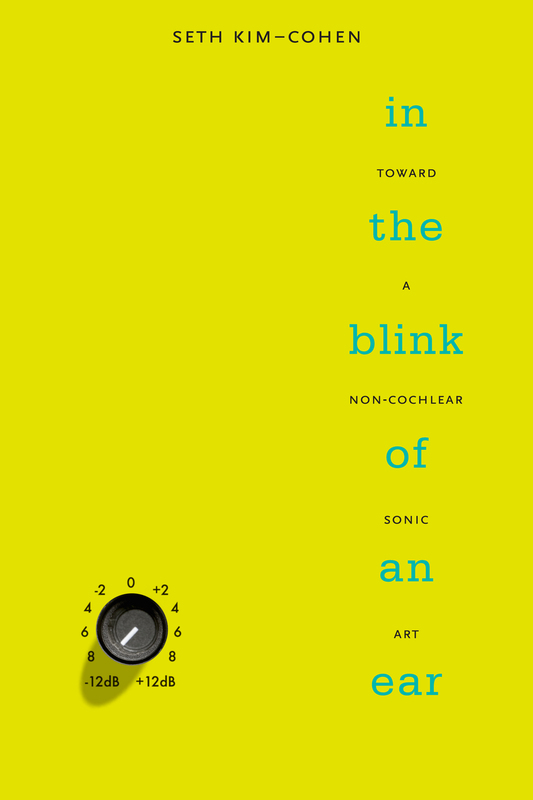 In The Blink of an Ear is an attempt to re-tell the story of the sonic arts from within the world, rejecting otherworldliness and any notion of a realm beyond. Against Ambience is equally committed to worldliness. But instead of focusing on the long, international history of the sonic arts, the new book examines a few months in New York and treats sound as one instantiation of the broader category of ambience. ER. Although your new book is a critique of ambience, is it perhaps more specific to the relevance/function of ambience during a post-crash society? SKC. Against Ambience closes with what I admit is a speculative naming of suspects: a short list of the cultural, historical conditions that may have given rise to an interest in ambience. I name information, politics, and transcendence, and I think each can be linked to what you call “post-crash society.” For example, ambience may be a response to the oft discussed “information overload.” The global economic crash of 2008 was made possible by the massive amounts of information that can now be extracted, stored, and communicated. All the financial exertions that inflated bubbles and animated economic ghosts would have been impossible in earlier informational eras. It seems just as accurate to call what happened a “data crash” as to call it an “economic crash.” In the epoch of binary code, capital is no longer broadly symbolic. It is now merely a series of ons and offs. The masters of global capital are ever closer to controlling each switch. Instead of the haves and the have nots, we now have the ons and the offs. ER. It’s refreshing to read something that’s commenting on exhibitions, which have literally just happened, this year. When did you start thinking of this book and how fast was that process? SKC. Against Ambience is a kind of writing and publishing experiment. It was written in just a few weeks. It is an attempt to respond in nearly-real time to the events of the summer of 2013 in New York. I am denying myself the benefits of time and distance and trying to understand a moment from within it. The book will be published by Bloomsbury exclusively as an e-book (at least at first), this being the quickest way to get the book into the hands of readers. The hope is that this book works in and with (and against) the tendencies it observes while those tendencies are still alive and unfolding. It was an exciting way to work. I don’t look forward to going back to writing from an outside, long-view perspective. I like the vitality of this kind of project. Of course, I realize it’s risky too. The quick turnaround is sure to have engendered some technical and intellectual mistakes. But I don’t mind making mistakes. Screw efficiency. With Lou Reed heavy in my thoughts, I consider the process an act of growing up (messily) in public. ER. In the book you describe the curatorial turn as a movement towards ‘percepts’ i.e. a fascination with perceptual objects, sensory phenomena (including sound) and spectacular yet meditative works. As much as the book is against ambience is it more against curatorial ambience rather than artistic ambience? SKC. I can’t see how one makes this distinction between the curatorial and the artistic. If we’re talking about work that makes its way to us via both artists and curators, then what we experience is necessarily a curatorial-artistic construct. It’s also political, economic, gendered, historical, and art historical. To a great degree, I see art as a machine for producing responses. And responses, in order to be activated, must be put into circulation. And to be put into circulation, responses must be translated into, or generate, discourse. It’s great if I’m moved by a painting, or a film, or a song. But if that feeling never leaves me, never moves anything else in the world, then the work has failed. Or I have. The way feelings leave us is through discourse: talking and writing. This doesn’t mean that I devalue art as a practice, or that I think we can or should replace art making with discourse making. I think art catalyzes responses and discourse that wouldn’t emerge otherwise. So, I’m devoted to art making. ER. I think there’s some interesting cross over here with your project Tomorrow Is The Question? Is The Question! (2012). Could you reflect on that a little. When people responded to the ad, we exchanged emails about music, about their backgrounds and interests, and mine. I selected the people I thought could bring something interesting to this imagined music. 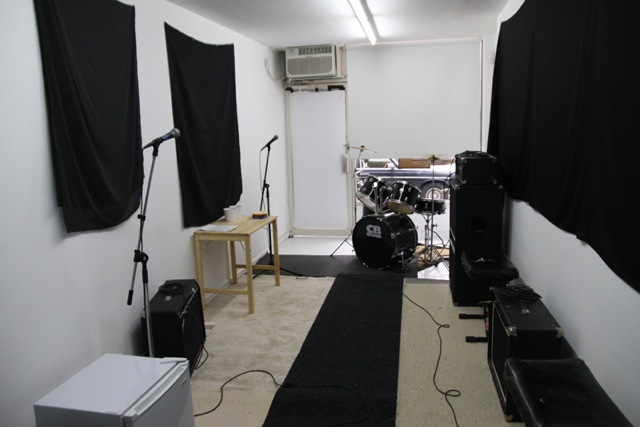 I then invited a group of selected respondents to the gallery, which had been set up as a rehearsal space, with drums, amps, a p.a., and a fridge full of beer. Each group was given two and a half hours in the space. I didn’t attend. So this was just like a typical situation in which someone advertises to form a band, except in this case, the person who initiates the project isn’t present to organize, make decisions, provide musical direction, or decide who’s in and who’s out. 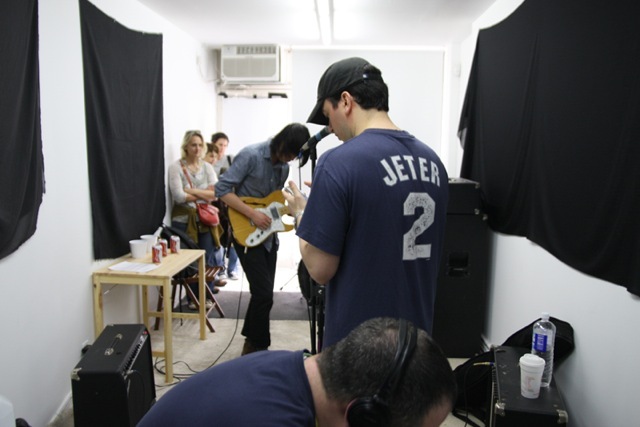 The group of strangers were left to decide how (or if) to interpret the ad’s description, how to coordinate themselves as a band. We recorded each session and I edited each recording down to a pair of seven-minute pieces to be released on a clear, 10-inch acetate. This project is as curatorial as it is artistic. More crucially, it acknowledges the discursive seed and harvest of the process of music making. We start from some words about what this music will be, why we’re making it, who does what. We organize ourselves, socially and musically, in conversation. The process yields music, yes, but just as importantly, it yields thoughts, discussion, and writing about how the genesis, authorship, history, creation, and interpretation of music interact in complex ways. Ultimately, this project reveals how all these “extra-musical” aspects of music are, in fact, what we’re engaged with when we engage with music. And these aspects are the very stuff of being alive, of negotiating the demands of time, other people, history, form, gesture, meaning, and being. ER. I’m interested in your dissection of the sine wave, particularly the notion of a pure sine wave, which is deployed regularly within the ambient works you comment on. Could you say something about this and perhaps this illusion of purity I think you’re hinting at? SKC. I use sine waves (sometimes called “pure tones”) as a kind of synecdoche for sound in general. I suggest that sine waves are prevalent in sound art because they function as a kind of zero degree, a reductio ad absurdum, of sound. Sine waves are free of harmonic overtones. So some like to believe they are free of other kinds of overtones too, social, political, historical. Some sound art proposes that if sine waves are pure and are the elementary particles of sound, then sound must be pure too. But sine waves have their own history, their own connotations, their own instruments, and conventions of use. Outside of the technicalities of harmonics, there’s nothing pure about sine waves. ER. Does the book offer a counterpoint to ambience – do you drawn upon works to show another possible route? SKC. I nominate dub as ambient’s other. But in true Derridean fashion, dub isn’t simply the opposite of ambient. The two are imbricated and co-dependent. Still, they offer decidedly different ways of thinking about work. In some of Eno’s writing about his process, he mentions dub – Lee “Scratch” Perry, in particular – as a precedent. As musical genres, dub and ambient display some similarities: both use recording and mixing technology as a generative tool; neither documents a live performance; both revel in sonic effects, like reverb and echo, that suggest sound moving in space. But where ambient invites individual listening (think of Eno’s creation myth of ambient: lying alone in his sick bed, unable to get up to adjust the volume of the too-quiet music), dub developed as a collective music. Dub plates were acetates produced for sound system parties. Often a mix was custom made just-in-time for a particular event. Ambient has its genesis in the English countryside, the singular brainchild of an art college educated, middle-class, white man. Dub is born in urban Jamaica, developed through the collaborative practices of black musicians and studio engineers working on jerry-rigged equipment. When ambient is used to mean environment, the environment in question is always a nebulous, otherworldly (or unworldly) space. As Timothy Morton points out, there are other kinds of environments, so there must be other kinds of ambience: urban, anxious, dismal, giddy, aggressive. The environment of Eno’s ambient is private and privileged. Art historically, its values are a regurgitation of Cagean values, transferred from the high art context of the mid-century musical avant-garde, to the mercantile practices of pop and rock. Dub emerges from social exigencies: each sound system needs something unique to draw people to its party. Eno’s ambient tries to level foreground and background so that the music interacts, non-hierarchically with its environment. Dub repositions elements that typically play a supporting role (bass and drums), moving them to the foreground. The conventional foreground elements (vocals and guitars) are removed to clear space. Dub is pop music turned inside out, not merely flattened, but re-ordered to demand a new kind of listening. This listening emphasizes rhythmic elements and cyclicality over melodic lines and thematic development. Michael Veal, in his book on dub, suggests that this revision is a socio-political response to the Europeanization of African cultural output. He even goes so far as to say that dub’s deletions, its vacated spaces, can be heard as a response to the historical trauma suffered by African people. ER. So dub can be read as a form of ‘engaged ambience’? SKC. I propose “dub” as an aesthetic modifier, in the same way that “ambient” is used to describe art practices beyond music. For example, the exhibition ambient at Tanya Bonakdar Gallery in Chelsea included 6 of Sherrie Levine’s “Black Mirror” pieces. I find it impossible to think of these pieces as ambient. 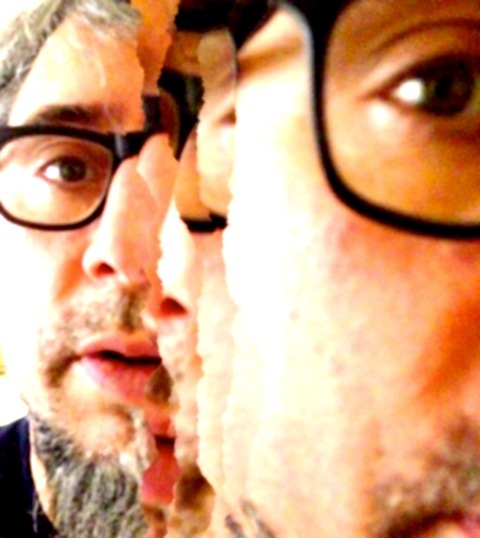 Understood in the context of Levine’s work, they are remixes, they are dub mixes. They start from tracks that have already been laid down: monochromes, the mirrors of the mise en abyme, or, as reflective surfaces – tableaus waiting to depict something vivant. They turn all these references inside out the same way dub inverts song form. In doing so they demand a reshuffling of art historical demands, desires, and values. The only way to think of these pieces as ambient is to pretend you don’t know who Sherrie Levine is or what her work is about. ER. It seems you are advocating artworks, which through their re-presentation, connect to language, text, reading and discourse. Does this mean you’re only concerned with human-to-human relations? So much of sound art deals with non-human species and phenomena – does this mean they (animals, inanimate objects, tools, even sound as a mechanical vibration) are excluded from the debate because they can’t speak ‘our’ language? SKC. I understand the importance of engaging with non-human entities in sound art and in the new materialist philosophies. But I also recognize the limitations of these engagements. As a human being, I inevitably understand such entities through human apparatus. This means that sensory phenomena are necessarily anthropomorphized by my sense organs. The only vibrations I can hear as sound are those between 20 and 20,000 hertz. In order for me to hear them, these vibrations must travel the path of my ear canal. High frequencies and low frequencies activate different locations within my ear. What I hear is literally formed by my anatomy on its way to my cochlea and then further transformed by my nervous system’s relays and responses. Additionally, phenomena are anthropomorphized by human conventions and categorizations. I understand why some think this is a problem. But I’m not convinced by their solutions. Deterritorialization and rhizomatics are still human concepts. They are still anthropomorphizations. The trick, as I see it, is to avoid conflating anthropomorphic with anthropocentric. Just because I am forced to take in the world through my human anatomical and cultural apparatus, doesn’t mean that I think my receptions and understandings are privileged. I must remain vigilant to whatever biases my anthropomorphisms encourage. I must develop techniques to counteract those biases. And I must be committed to resisting any sense that my understandings are “true” or special. ER. Going back a little. You have a varied background in fine arts, writing and curating – I’m curious to know how and when sound became a focus for you? SKC. In 1989, I was in the MFA program in Creative Writing at Columbia. I paid for books and drinks by working at Artists Space, a non-profit gallery in Tribeca. Before I finished my degree, I dropped out to start a band. We moved to Madison, Wisconsin. We rented a house sandwiched between a recycling center and an electrical substation where we could play at any hour of the day or night. After 9 months, we moved to Chicago. From 1990 until 2002, I played in Chicago-based bands. The best of which was The Fire Show, indebted in equal parts to This Heat, The Birthday Party, Lee Perry, Television, Public Image, Pan Sonic, and Johnny Cash – although many critics at the time thought we managed to transcend those influences. 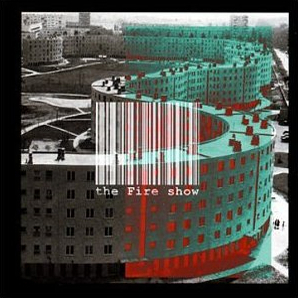 Toward the end of The Fire Show, I started to chafe against the formal and conventional restrictions of the band format. For example, we organized a show at a venue in Chicago called The Hideout. Each audience member was given a numbered ticket as they entered. A number was announced and the holder of that ticket was escorted from the front barroom into the rear performance space. The audience member was seated in front of the stage and we introduced ourselves the way you would if meeting a stranger at a party (“hello, our name is The Fire Show, what’s yours?”) Lights were trained on the listener (rather than the band), a photographer took a large-format Polaroid portrait of the listener while we performed a private, one-minute concert. A CD of the performance was burned on the spot and the audience member left with the photograph and the only documentation of the music [Documentation here]. ER. So the form and maintenance of its production ended up taking you in another direction? SKC. Yeah, it’s not the kind of thing that a band can take on the road. The project necessitates a specific spatial configuration. In that sense, it was site-specific. Plus, rock venues aren’t interested in this kind of project, nor are they equipped to handle its unique requirements, modest though they are. On top of that, a record company wants a band to play their recorded music. And rock audiences too, have different desires for a night at the club. The conventions of the rock production cycle just aren’t flexible enough to allow this kind of approach to flourish. It doesn’t function in the economic infrastructure of album-tour-album-tour. So, to answer the original question, I was a musician before I was anything else. And music single-mindedly consumed my energies for more than a decade. But the restrictions of the form became untenable. So I went back to school and did a PhD at the London Consortium, under the tutelage of the great cultural theorist, Steven Connor. I continued to explore music and performance. I did a one-man musical monologue at a rock venue in London. To live-looped guitars, I spun a first-person narrative about a quadriplegic writing songs in his head as he allows himself to die. I suppose the psychoanalytic reading of that piece would suggest that I felt paralyzed by the form and I let it die. That was the end of my rock career. ER. It seemed like quite an active period for you, I remember your Resonance FM broadcasts around that time amongst other things. SKC. I’m easily bored. So I tend to take on too much. My first foray into the art world was Symphony 0 at Peer Gallery in Hoxton, a 24-hour piece for solo acoustic guitar, strumming one chord, letting it decay to silence, before strumming it again, for the whole of a calendar day. Around the same time, I developed two radio programs for ResonanceFM in London. The first was “One Reason To Live,” in which one guest per episode chose one piece of music to listen to and then talk about for the remainder of an hour. Those conversations were published in book form by Errant Bodies. The second was “Unst: Bespoke Sound,” a weekly, hour-long piece of custom-made radio art for broadcast, that I produced with Drew Morgan, Paul Chauncy, and Rob Mullender. I pursued various works in sound. And I took it for granted that sound art had to be different, in nearly every way, from the music I used to make. But I’ve come to realize that I’m still making rock and roll. In fact, I’m making the kind of rock and roll I wanted to make when I quit The Fire Show. In order to make this kind of rock and roll, I had to give up on conventions like a band, venues, touring, albums. Those are the limiting factors. All along, without ever planning or even realizing it, I was groping toward a conceptual rock practice, a practice that treats rock as a source of cultural energy, as a discrete historical phenomenon, and as an aesthetic problem. ER. I enjoy the way your writing is always critical, always disruptive – is this something you consciously strive for? I’m guessing it is, but perhaps you could talk a little about your writing practice; how ideas and thoughts are articulated through writing; how that process begins and if there’s any notable reference point for you? SKC. Thanks. I find it gratifying when people notice not just what I write, but how I write. It’s part and parcel of the project. It’s performative. My work is always trying to poke holes in the barricades that divide practices and histories and disciplines. So, similarly, I try to write between and across registers. There are times when philosophical terminology is required to address specific histories or problematics. Other times, a belly laugh or a punch in the gut might be more effective. Lester Bangs is the greatest critic I’ve ever read. His writings about rock and roll are a form of rock and roll. His essays don’t sit outside of their concerns, passing judgment from a remove, they wrestle with the same issues the music is wrestling with and they wrestle with the difficulties of wrestling with something that’s already wrestling with something else and with the commensurate bankruptcy of objectivity and subjectivity. It’s a sloppy kind of wrestling: mud wrestling. Bangs is funny as hell. And sad as hell. He can’t abide the superficiality of rock and roll and, at the same time, he imagines it’s deeper than the Mariana Trench. When Bangs was writing for rock magazines, rock wasn’t yet taken seriously as a cultural form. His writing acknowledges this, while also agitating to change it, simply by finding in great rock and roll the same concerns and problems one finds in all great art. I try to write like Lester Bangs would have if he thought his readers were also reading Derrida and Borges and Wallace Stevens and Beckett and Robbe-Grillet. ER. And finally as always Ear Room asks: what does the term sound art mean to you? SKC. What it means to me doesn’t matter. Time will decide. Probably, it will fade away like “video art” and those who utter the phrase will seem quaintly out of touch, like a grandpa with a flower in his lapel. Reblogueó esto en María Andueza.